April 2015 Update: This post has been updated with new purchases. Lately I've been reading a lot of articles about the terrible effects of parabens in beauty products. Parabens have been used for decades as very effective preservatives in moisturizers, cosmetics, sunscreens, and deodorants, but in recent years, scientific studies have shown that parabens are absorbed into the skin and contribute to abnormal estrogen levels. So I went through all my foundations (most are drugstore) and checked the ingredients, either by looking on the back label or with some expert googling. Pro tip: Drugstore.com and Paula's Choice Beautypedia list most makeup products' ingredients. One important thing to note is the order in which ingredients are listed. Most of these foundations list either Methylparaben, Butylparaben or other parabens towards the end of the ingredient list, which means there's very little percentage of those ingredients, compared with the things listed at the beginning of the list. Still, I thought this list would be useful. 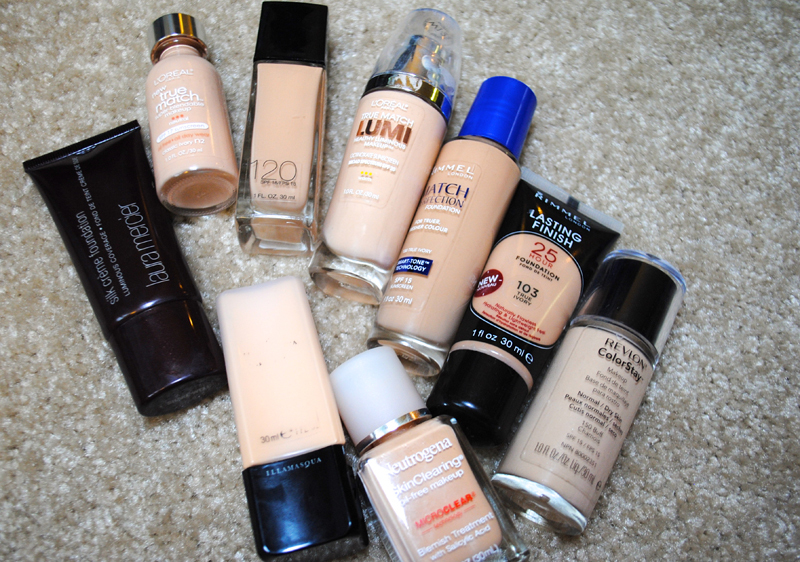 The foundations in the photo above all have at least one type of paraben, so that means I'm not going to repurchase them, no matter how much I love the way they look on me. My goal for the next few months is to use them up, then toss 'em! My biggest disappointment was the Laura Mercier Silk Creme foundation, as the shade i have, Rose Ivory, is my closest shade match ever! Argh! My second biggest disappointment is the Illamasqua Skin Base, since I literally just bought it a couple weeks ago. Lesson learned — do your ingredient research! Very useful list, thanks! Do you have powders that don't contain parabens? Hi penney! Thanks for the comment! I believe the MAC Mineralize Skinfinish Natural powders don't have any parabens (I really like those and they come in so many shades). As for drugstore powders, I've found that most DO contain parabens (including Maybelline FitMe, L'Oreal True Match, Revlon Nearly Naked powders as well as the Cover Girl powders). The Physicians Formula powders don't contain parabens and the new Wet n Wild Coverall powder doesn't contain them! Thanks for the tip on the Maybelline Dream Matte! I still haven't tried that one. Thanks so much for the list. Glad to see revlon colorstay whipped on the repurchase list. No problem Angel! Yes, that's a great one — I love the finish it gives my skin. Although it does seem to transfer a bit.